This page provides you with an overview of some of the main legal professions in the England and Wales jurisdiction of the UK. It includes information about judges, prosecutors and different types of lawyers. In the England and Wales judicial system, judges of differing judicial status – in both full-time and part-time posts – sit in the various courts and tribunals of England and Wales. You can find information about the judiciary in England and Wales on the Judiciary of England and Wales website. Lord Chief Justice – the Lord Chief Justice is the Head of the Judiciary of England and Wales and the President of the Courts of England and Wales. The latter role began on 3 April 2006 when the Lord Chancellor’s judicial functions were transferred to the Lord Chief Justice under the Constitutional Reform Act 2005. The Lord Chief Justice is also the Head of Criminal Justice. Heads of division – four senior judges head up the other jurisdictions: the Master of the Roles (Civil); the President of the Queen’s Bench Division; the President of the Family Division, and the Chancellor of the High Court (Chancery). For more information, please see the website of the Judiciary of England and Wales. Lords Justices of Appeal sit in the Court of Appeal, which deals with both criminal and civil cases. High Court Judges sit in the High Court, where the most complex civil cases are heard. They also hear the most serious and sensitive criminal cases in the Crown Court (for example, murder). Circuit Judges normally hear criminal, civil and family cases. District Judges deal with civil law cases. Most of their work is conducted in chambers (not in open court trials). They also have the power to try any action in a county court, with a sanction below a specified financial limit (which is reviewed from time to time): cases above the limit are generally heard by a circuit judge. District judges dispose of more than 80 percent of all contested civil litigation in England and Wales. District Judges (magistrates’ courts) sit in magistrates’ courts and deal with the types of cases dealt with by magistrates (see below). However, they assist particularly in cases dealing with lengthier and more complex matters. High Court Masters and Registrars are procedural judges who deal with the majority of the civil business in the Chancery and Queen’s Bench divisions of the High Court. Deputy High Court Judges, who sit in one or more of the divisions of the High Court. Recorders, who have similar jurisdiction to that of circuit judges, although they generally deal with the less complex or serious matters before the court. Deputy District Judges, who sit in the county courts and at the district registries of the High Court. They deal with the least complex cases that fall within the jurisdiction of district judges. Deputy District Judges (Magistrates’ Courts) deal with work similar to that of their full-time counterparts. Deputy High Court Masters and Registrars deal with work similar to that of their full-time colleagues in the High Court. Tribunals deal with nearly 800,000 cases a year on a huge variety of issues, such as disputes over tax, pensions or immigration. Tribunals usually sit as a panel, incorporating a legally qualified tribunal chairperson or judge, supported by lay panel members with specific areas of expertise. There is no jury and a tribunal judge does not have the power to imprison an unsuccessful party. Their main role is to try to bring about a successful resolution of the difficulties and, in some cases, to make a decision on the level of compensation or redress to be awarded to the successful party. Magistrates, also known as ‘justices of the peace’ or ‘JPs’, deal with about 95 percent of criminal cases in England and Wales. More than 30,000 magistrates carry out their duties in local areas and normally sit at least 26 half-days a year. They do not have to be legally qualified and are unpaid. They normally sit as one on a ‘bench’ of three, one of whom is trained to act as chairperson, helping guide the bench through its business and speaking for it. A ‘bench’ is always assisted by a legally qualified clerk to advise on law and procedure. Magistrates deal with relatively less serious criminal cases. These include minor theft, criminal damage, public disorder and motoring offences. They also hear a range of issues affecting families and children and licensing applications. The Crown Prosecution Service (CPS) is the independent authority responsible for prosecuting criminal cases that have been investigated by the police in England and Wales. It is superintended by the attorney general, who answers to Parliament for the CPS. England and Wales is divided into 42 prosecution areas, each of which is headed by a chief crown prosecutor. In addition, there are four specialised national divisions: organised crime, special crime, counter-terrorism and the fraud prosecution service. A telephone service, CPS Direct, provides out-of-hours advice and decisions to police officers across England and Wales. The CPS is led by the Director of Public Prosecutions (DPP), who makes decisions about the most complex and sensitive cases and advises the police on criminal matters. The DPP has overall responsibility for the charges and prosecutions brought by the CPS and reports to the attorney general. The CPS employs prosecutors and associate prosecutors, as well as caseworkers and administrators. Crown prosecutors are experienced barristers or lawyers, responsible for prosecuting criminal cases on behalf of the Crown. Associate prosecutors review and present a limited range of cases in magistrates’ courts. Prepare cases and present them in court. A citizen of the European Economic Area or the Commonwealth. Lawyers who qualified outside England and Wales are required to take and pass a lawyer transfer test before taking up a post. The Bar Council is the governing body for all barristers in England and Wales. It was established to represent the best interests of the profession, to formulate and implement key policy initiatives and to maintain the standards, honour and independence of the Bar. In accordance with the Legal Services Act 2007, it has delegated the task of regulating the profession to the independent and ‘ring-fenced’ Bar Standards Board. 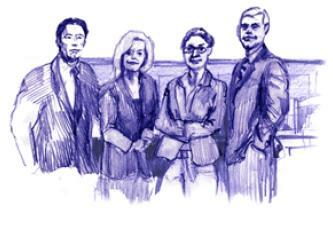 Barristers are individual specialist legal advisers and courtroom advocates. Generally speaking, they are self-employed and work in groups in offices known as ‘chambers’, where they are known as 'tenants'. Barristers are trained mainly in advocacy; in other words, they are trained to represent their clients in the higher courts. Barristers also spend a lot of their time advising clients and researching cases, as well as researching their field of expertise. Approximately 10 percent of practising barristers are Queen’s Counsel (or QCs) who deal with the most important and complex cases. A solicitor's job is to provide clients (members of the public, businesses, voluntary bodies, charities, etc.) with skilled legal advice and representation, including representing them in court. Their work varies enormously. Most solicitors work in private practice, which is a partnership of solicitors who offer services to clients. They may have a general practice covering many areas of law or specialise in a particular field. Others work as employed solicitors for central and local government, the Crown Prosecution Service, the magistrates' courts, a commercial or industrial organisation or other bodies. Solicitors can choose the kind of environment that suits them best. Generally solicitors provide legal advice to clients. If those clients then require to be represented in the higher courts in England and Wales, the solicitor will generally instruct a barrister to conduct the case in court. A barrister is not always required, however, as suitably qualified solicitors have rights of audience (that is, they are entitled to represent clients) in the higher courts. The Law Society represents solicitors in England and Wales. Its duties range from negotiating with and lobbying the profession's regulators, government and others to offering training and advice. The Law Society exists to help, protect and promote solicitors across England and Wales. The Solicitors Regulation Authority (SRA) deals with all regulatory and disciplinary matters, and sets, monitors and enforces standards for solicitors across England and Wales. Formerly known as the Law Society Regulation Board, it acts solely in the public interest. The Office for Legal Complaints is for members of the public wishing to make a complaint about a solicitor. Formerly known as the Legal Complaints Service, this independent and impartial body will work to resolve any issues quickly and efficiently. Notaries form the third and oldest branch of the legal profession in England and Wales. Notaries are admitted to practice and granted their faculty (authority to practise) by The Faculty Office (the Archbishop of Canterbury first did this in 1279) and the regulator is the Court of Faculties. Notaries provide a bridge between the civil law and the common law. All notaries have a legal training and, although most of them may also be solicitors, qualification as a notary is by way of independent and separate examinations. Notaries must all follow the same initial course in order to qualify for the profession: successful completion of the notarial practice course provided by University College London is required. Once qualified, notaries are able to practice anywhere in England and Wales and all have the same powers. In addition to preparing and issuing notarial acts and instruments, notaries may also advise in relation to the preparation of Wills, succession matters, the administration of estates and carry out the conveyancing of property. Notarial activities have been recognised worldwide for centuries and this has allowed citizens and business to circulate freely. In this way, notaries facilitate commerce and life for ordinary citizens, allowing them to go about their daily lives and conduct business freely at reasonable cost and without undue delay. A notary holds an official seal and notarial acts in England and Wales have probative force. Notarial acts are prepared in private and in public form; the latter are also known as ‘notarial acts in authentic form’. Notarial acts under the signature and seal of a notary are recognised as evidence of a responsible legal officer in all countries of the world. Notaries are subject to similar professional rules as solicitors and are required to renew their notarial practising certificates annually and hold professional indemnity and fidelity insurance cover. Renewal is subject to compliance with the rules. A notarial appointment is a personal appointment held by an individual notary. The Notaries Society is the membership organisation that represents approximately 800 notaries public. The Society of Scrivener Notaries represents approximately 30 scrivener notaries who practise mainly in central London, appointed by the Scriveners Company, an ancient guild. Apart from those working in the magistrates’ courts, the clerks and other staff in most courts in England and Wales are not required to be legally trained. They are civil servants who deal with administrative matters and assist judges. They may not provide legal advice. As civil servants, all court staff are employed by Her Majesty’s Courts and Tribunals Service. More information on court staff categories can be found here (456 Kb) . The role of clerks is different in magistrates’ courts. Lay magistrates are not legally qualified and they rely on advice from legally trained clerks, of which there are two types: justices’ clerks and legal advisers (or court clerks). Justices’ clerks are the principal legal advisers to magistrates. They are lawyers (either barristers or solicitors) with at least a five-year relevant qualification. They advise magistrates on law and procedure both in and out of court. They are also responsible for the management and training of legal advisers, the quality of legal services provided and the provision of consistent legal advice throughout their administrative area. Legal advisers sit in court and advise magistrates on law, legal practice and procedure. They, too, are legally qualified (usually as solicitors or barristers). High court writs are now enforced by high court enforcement officers, who are appointed and assigned to districts by the Lord Chancellor or his or her delegate. They are responsible for enforcing court orders by recovering money owed under a high court judgement or a county court judgement transferred to the High Court. They can seize and sell goods to cover the amount of a debt. They also effect and supervise the possession of property and the return of goods. County court bailiffs are civil servants employed by Her Majesty’s Courts and Tribunals Service to deal with enforcement of judgments and/or orders made and registered in the county courts. They are civil servants who enforce warrants of execution, repossess land with warrants of possession and recover goods under warrants for return of goods. The regulation for bailiffs who execute warrants is set out in sections 85–111 of the County Courts Act 1984. The procedures for execution are set out in the civil procedure rules. In addition, county court bailiffs carry out other duties, including personally serving documents and warrants of committal. The regulations on committal are set out in section 118-122 of the County Courts Act. Certificated bailiffs are private bailiffs certificated under the distress for rent rules, and are authorised by a circuit judge sitting in the county court. Distress for rent refers to the seizing of a tenant’s goods by a landlord to secure payment of rent arrears without the intervention of the court. Under a number of other Acts, certificated bailiffs are also permitted to enforce other specific debts, such as council tax and non-domestic rates.